DIR’s charter is to administer a number of New South Wales statutes, the most significant of which is the Industrial Relations Act 1996. DIR’s vision is statewide compliance with the NSW industrial framework in an environment that is equitable and which promotes workplace reform. DIR’s mission is to work with employees, employers and their representatives to facilitate equitable, innovative and productive workplace relations. DIR had utilized RecFind for records management since 1997, however prior to the EDMS project RecFind’s use was limited to managing historical records only. 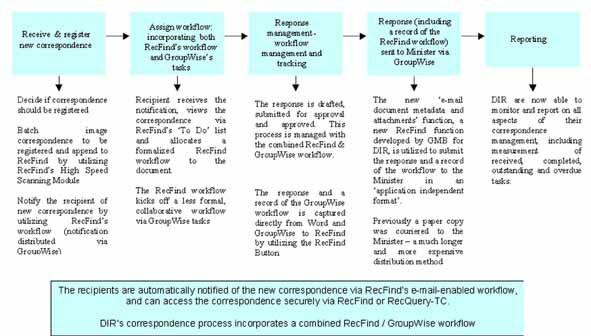 For example, a ministerial correspondence document received would be registered, and the workflow process managed, in a number of disparate registers and systems prior to be registered to RecFind at the conclusion of the workflow process. To resolve these issues it was recommended to implement a ‘paperless’ workflow process by expanding the use of RecFind to encompass imaging, electronic document management and workflow, and widen RecFind’s application use to include correspondence management, in addition to its use for records management. enabling all DIR employees to effectively manage information (including scanned images, electronic documents, e-mails, physical files) and collaborate on workflow action tasks in a ‘paperless’ environment. The DIR EDM Project Manager Richard Hayes felt the main obstacle to a successful implementation to overcome was the cultural change – employees were accustomed to paper processes. Richard overcame this obstacle by utilizing GroupWise in conjunction with RecFind for the new workflow process. “Everyone was very familiar and comfortable with GroupWise so the change to incorporate the new RecFind / GroupWise workflow was minor and the implementation was surprisingly smooth”.